Just a reminder that this Wednesday I begin my weekly trips to historic Green-Wood Cemetery. For more information check out my tours page here. Saturday, May 5, 1 - 4 p.m.
Free Celebrate the amazing ritual of migration and welcome dozens of amazing bird species to the Park. Sunday, May 6, 8 a.m.
FreeMeet the amazing birds who use the Park as a migratory layover on this expert-guided walk. Start your Sunday morning surrounded by nature! Greetings. 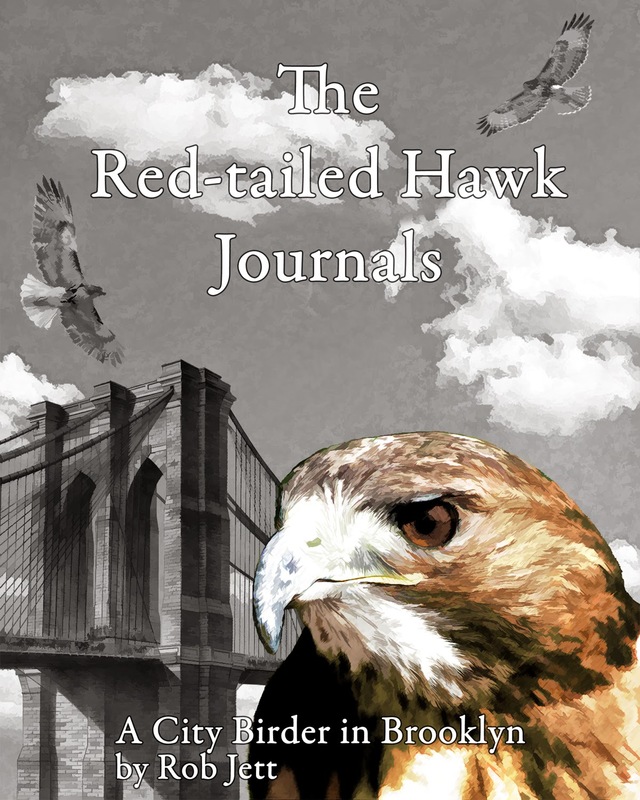 This is the New York Rare Bird Alert for Friday, April 27th at 7:00pm. The highlights of today's tape are MAGNIFICENT FRIGATEBIRD, WHITE-FACED IBIS, YELLOW-THROATED WARBLER, PROTHONOTARY WARBLER, KENTUCKY WARBLER, BLUE GROSBEAK, GULL-BILLED TERN, and UPLAND SANDPIPER. A good spring week, thanks in part to a material storm that swept a decent number of migrants up the coast with it. A few rarities also appeared, certainly topped by the report of a male MAGNIFICENT FRIGATEBIRD seen midday Monday from Montauk Point, the bird working its way west along the north shore of the Point. Some damage to the right tip of the forked tail could identify this individual should it be seen elsewhere, but there have been no subsequent sightings yet. Another good bird locally was an adult WHITE-FACED IBIS initially spotted at the south end of the West Pond at Jamaica Bay Wildlife Refuge Tuesday afternoon, and seen again there on Wednesday morning. The ibis appeared with a number of Glossy Ibis near Bench 7. In recent years when a White-faced has been visiting Jamaica Bay, besides this location one has also been seen in the marsh south of the West Pond or along the West Pond shore at the north end, or in the adjacent marsh north of the West Pond. The ibises usually feed in the marshes and come into the pond periodically to bathe and drink. Some good activity began last Saturday in Central Park with a finding of a PROTHONOTARY WARBLER and a nearby female BLUE GROSBEAK at the north end. 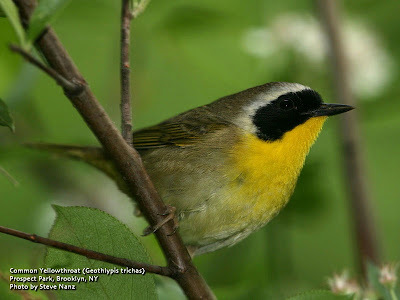 Other warblers noted that day included a continuing ORANGE-CROWNED WARBLER at the north end, and CAPE MAY WARBLER, WORM-EATING WARBLER, and HOODED WARBLER. During the week, additional warblers appearing there featured BLUE-WINGED WARBLER, NASHVILLE WARBLER, BLACK-THROATED BLUE WARBLER, BLACK-THROATED GREEN WARBLER, a CHESTNUT-SIDED WARBLER today, more PRAIRIE WARBLERS and BLACK-AND-WHITE WARBLERS, an AMERICAN REDSTART today, OVENBIRD, NORTHERN WATERTHRUSH, COMMON YELLOWTHROAT, and another highlight: a KENTUCKY WARBLER found just west of the Shakespeare Garden today. Other notables this week in Central have included SOLITARY SANDPIPER, SPOTTED SANDPIPER, RUBY-THROATED HUMMINGBIRD, GREAT CRESTED FLYCATCHER since Monday, EASTERN KINGBIRD, four species of vireos including YELLOW-THROATED VIREO, VEERY, WOOD THRUSH, SCARLET TANAGER, ROSE-BREASTED GROSBEAK, INDIGO BUNTING, BALTIMORE ORIOLE, and a few PURPLE FINCHES. Prospect Park has also had a couple of surprises, especially the UPLAND SANDPIPER visiting Long Meadow early on Wednesday morning. WILSON'S SNIPE was also there Wednesday, and among the various warblers reported was an early CERULEAN WARBLER on Thursday. In Bryant Park, a male PROTHONOTARY WARBLER found Monday was still being reported today. The bird feeds in the trees surrounding the green, behind the New York Public Library just below 42nd Street, east of 6th Avenue. It circulates about the park, occasionally coming down lower. A few other species of warblers and WOOD THRUSH have also been seen there. The Sunday-Monday storm dropped a few BLUE GROSBEAKS and other birds along the south shore of Long Island. A BLUE GROSBEAK found Tuesday at Gilgo, usually east of the restrooms there, was still present today. Other Tuesday BLUE GROSBEAKS included one near the Wantagh Parkway at Jones Beach and one in Queens at the All Faiths Cemetery in Middle Village. Accompanying the grosbeaks were scattered flocks of INDIGO BUNTINGS, and also found in the Jones area were a CATTLE EGRET at the West End Tuesday, a GULL-BILLED TERN at Gilgo Wednesday, and such shorebirds at West End as SEMIPALMATED SANDPIPER, SHORT-BILLED DOWITCHER, and RED KNOT. A HOODED WARBLER was also at West End Monday, when several LESSER BLACK-BACKED GULLS were noted: one at West End, three at Captree State Park, one at Robert Moses State Park, and one at Heckscher State Park, this joined by an ICELAND GULL. The YELLOW-THROATED WARBLER found on the 19th at Connetquot State Park was still singing near the fish hatchery restrooms, at least to Monday. Birds reported from Mecox Bay this week have included up to three CASPIAN TERNS and a BLACK SKIMMER. A PROTHONOTARY WARBLER was at Terrell River County Park last Sunday, and other arrivals have included LESSER YELLOWLEGS, LEAST SANDPIPER, and RED-EYED VIREO. While most of Team eBird is down in Texas making Big Day history, I, David La Puma, have been charged with filling in for them in writing this week's migration forecast. In doing so, I have also called upon a team of migration experts from across the country to weigh in on the regional components of this most exciting BirdCast. Thanks to Drew Weber, Greg Haworth, Max Henschell, Tom Auer, Tim Schreckengost, Angel and Mariel Abreu for their contributions and local expertise. Thanks also to Team eBird’s Brian Sullivan and NOAA’s Dave Nicosia for their insight into species distributions and weather respectively. Now, let the games begin. Daily forecast maps are available here. Olive-sided Flycatchers should be on the move this week, especially across areas along the West Coast. 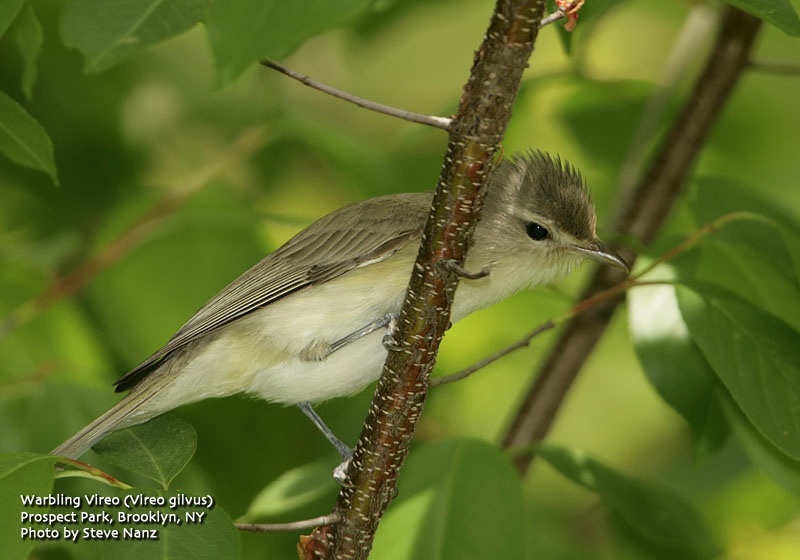 An interesting species, Olive-sided Flycatcher shows a strong pattern of earlier arrival on the West Coast, followed by a later May arrival into the eastern and northern portions of its range. Widespread geographically, Olive-sided may be a species worthy of further scrutiny, as its taxonomy is still confused. In the West birds average larger, especially the bill, and this difference is most pronounced in birds breeding in southern California. But there are other differences not readily apparent in the museum tray: the above mentioned migration timing differences, and perhaps most importantly a subtle difference in the songs of Eastern and Western birds: listen carefully to the length and delivery of the middle note of the three-parted song. More study is needed to describe these differences, but keep an eye out across the West this week for returning Olive-sideds, as well as a careful ear for their distinctive 'quick-three-beers' song. Observers in the East should also be alert, but don't expect to see Olive-sideds arrive there for another ~2 weeks. Southeast flow across the Upper Midwest will turn more southerly as high pressure moves south from Canada over the weekend. By Sunday morning we should see a strong interaction between the next cold front approaching from the west and the Canadian high now over the Mid Atlantic. This southerly flow will trigger widespread migration into the Upper Midwest from Sunday night into late next week. Because this southerly flow extends down into Texas, expect many Neotropical migrants to show up throughout the Upper Midwest during the forecast period. Birders in northeast Wisconsin and the central and western Upper Peninsula of Michigan should be on alert for fallout conditions on Monday morning due to thunderstorm potential, as well as concentrations along the northern and western shore of Lake Michigan as birds get pushed east on southwesterly winds. This could represent the first big push of neotropical migrants into the the Upper Peninsula. While winds should continue to be favorable across the region through mid-week, some storm activity moving into the Upper Midwest will likely shut things down locally. Conditions will deteriorate into late next week as precipitation becomes more widespread and winds turn northerly. Every year, shortly after April's first trickle of migrating warblers appear, I get irritably impatient for mornings of blaring dawn choruses and colorful, hyperactive songbirds dancing in the treetops. The spectacle predictably commences by early-May, but that knowledge does little to quell my restlessness. That said, we did see a few new birds over the weekend, plus, a private tour that I led in Green-Wood Cemetery yesterday revealed some new migrants. Like most of the birders in the northeast, Heydi, Paige and I concluded that Friday's overnight South winds would bring some new migrants into Prospect Park and the surrounding area. We arranged to meet at Grand Army Plaza at first light to start our birding at the park's north end. A short walk from the plaza, the Vale of Cashmere's tall surrounding trees and year round water source is usually a good draw for migrating birds. We've experienced many incredible Spring dawn fall outs at this spot. It was not the case on Saturday. 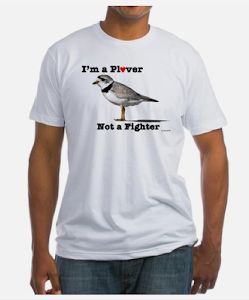 Even the recent influx of Yellow-rumped Warblers and Hermit Thrushes seemed to have moved on. At the south end of the Vale I did notice one new season arrival. Hopping around in the shrubs low to the ground was a striking Common Yellowthroat. For the most part, however, it was a pretty quiet morning. In addition to a scarcity of Hermit Thrushes the recent rush of Ruby-crowned Kinglets had also flown off on the South winds. Another new warbler for us for the year was Yellow Warbler. We walked the entire perimeter of Prospect Lake and heard our first one on Three Sisters Island. A second one was heard then seen high in the canopy within the Ravine. Chimney Swifts have also begun to arrive, although in very small numbers. 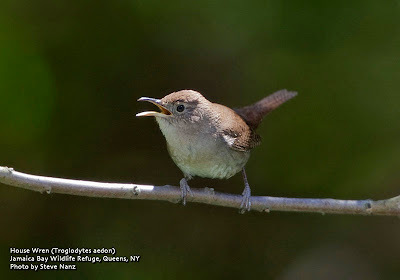 One very conspicuous Spring newcomer is House Wren. Their energetic, bubbly song was heard throughout the park with at least 5 individuals seen. In coming weeks they'll be found nesting in streetlight fixtures and tree cavities in all the city's parks. Savannah Sparrows were observed migrating through Prospect Park with a few at Breeze Hill, the South side of the lake and on Lookout Hill. Maybe we'll see a fallout with the next round of South winds ... and hopefully that will happen on the weekend. After a less than stellar early morning in Prospect Park, Heydi and I decided to head to Floyd Bennett Field. We were hoping to find some dabbling ducks at the "Return a Gift Pond", more specifically, a Blue-winged Teal. Upland Sandpipers had been reported migrating through NYS, so we figured that the grasslands at Floyd Bennett would be the best place to search for one in Brooklyn. Our first stop was at the Cricket Field, where any chance of finding birds was quashed due to a guy running a gasoline-powered remote control car through the grass. The "Return-a-Gift" Pond was depressingly devoid of birds, waterfowl or otherwise. We decided to walk through the tree, shrub and phragmite habitat of the North Forty towards Mill Basin, then walk the shoreline towards Raptor Point. The sweet fragrance of blooming Autumn Olive trees pervaded the entire north end of Floyd Bennett. Birds were few and far between, but we did come across several Question Mark butterflies. Apparently there was a hatch-out of these anglewings in the area as we ultimately spotted them all over Floyd Bennett Field. 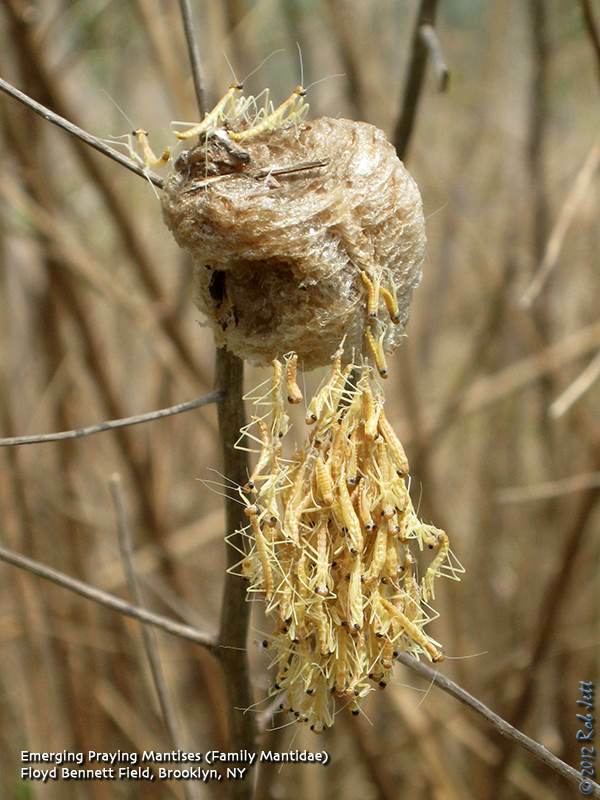 Another fascinating, non-bird observation was of a mantis egg case. I noticed this small, beige sphere attached to a bare shrub. I recognized it as a mantis ootheca from a distance, but wasn't sure what the structure was dangling off of the bottom. As we got closer, I realized that it was actually dozens, if not hundreds, of mantis nymphs emerging. Periodic breezes would carry off some of the mantids to begin their new lives. Others were climbing out onto the twigs adjacent to their nursery. 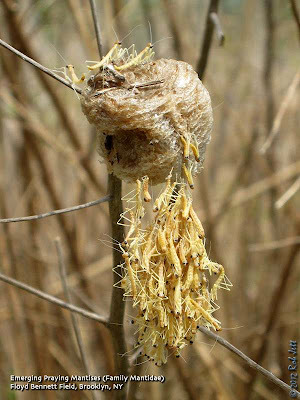 I'd come across many of these egg cases in the past, but never been fortunate enough to witness the nymphs hatching. We wondered which species this was and I presumed that it was Chinese Mantis as this introduced species is very common around New York State. I tried asking the young mantis, but they weren't talking. They were lucky that it wasn't a very birdy day, or later in the migration as I'm sure flycatchers, warblers and other insectivores would have devoured most of them. Throughout the course of the late-morning and early-afternoon we noticed lots of Double-crested Cormorants migrating. We counted flocks with as few as 8 individuals and as abundant as 57. By 2:30pm we had tallied over 200 cormorants flying overhead. We didn't find any shorebirds at the end of Archery Road or at Dead Horse Bay. A flock of five Forster's Terns were new for the year, but otherwise it was a very slow day for Spring birds at Floyd Bennett. In addition to the Question Marks, we spotted seven other species of butterfly, which made it the most butterfly-y day so far this year. Wednesday morning I led a private tour of Green-Wood Cemetery. The morning alternated between sunny and warm and overcast and nippy. When I left the house it was a brisk 40 degrees, so I wasn't too optimistic that there would be a lot of bird activity. A Northern Parula singing in an oak tree near the bus stop gave me some hope that, perhaps, some new birds had come in overnight. The group I was meeting at the cemetery had actually "Won" me at a fundraising auction. Maybe I should elucidate. Every year David Parsons Dance organizes a gala event which features silent and live auctions. Over the years my wife and I have seen many great Parson's Dance performances and also attended their gala. This year she suggested to their executive director that they add one of my tours to their auction. I suspect that my tour didn't elicit as much bidding excitement as say "Ten Day Adventure of a Lifetime for Two to Hong Kong and Thailand - Includes Air and Accommodations", but I was happy to do my part to raise money for the arts. My optimism after hearing a parula singing on 5th Avenue slowly diminished as we made our way up Syringa Path towards Battle Hill. I expected to find songbird activity within a row of oak trees, but most have already lost their dangling, golden catkins where warblers would be probing for insects. Most of the Norway maples had also bloomed early this year and now sprinkle the ground with pale green jimmies. From the edge of Battle Hill I spotted a lone Chimney Swift fluttering back and forth above 5th Avenue like a giant, brown butterfly. After checking the highest point in Brooklyn we continued south, towards the Pierrepont memorial. Along the way we spotted our first House Wren of the day and a few Chipping Sparrows. 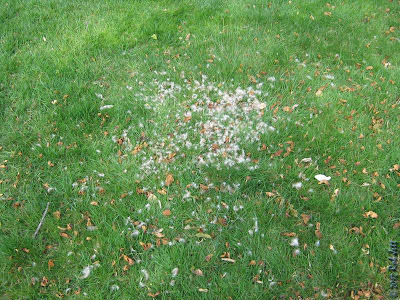 At the fringes of the chipping flock a Field Sparrow sang his simple, bouncing song from the top of an azalea shrub. The Dell Water is surrounded on three sides by a steep ridge. At the edges of the pond are a pair of Weeping Willow trees that usually attract a fair amount of Spring songbirds. Today there were only a few Yellow-rumped Warblers and a single Palm Warbler. A Red-bellied Woodpecker called his mate while clinging to the opening of a nest cavity that he had excavated in a Black Cherry tree. As we continued our walk towards the Crescent Water a singsong phrase near the top of a tree caught my attention. A small, gray bird was hopping around between the tops of a maple and black cherry. The ascending phrases of his whistle was distinctive and we watched our first Warbling Vireo of the year. 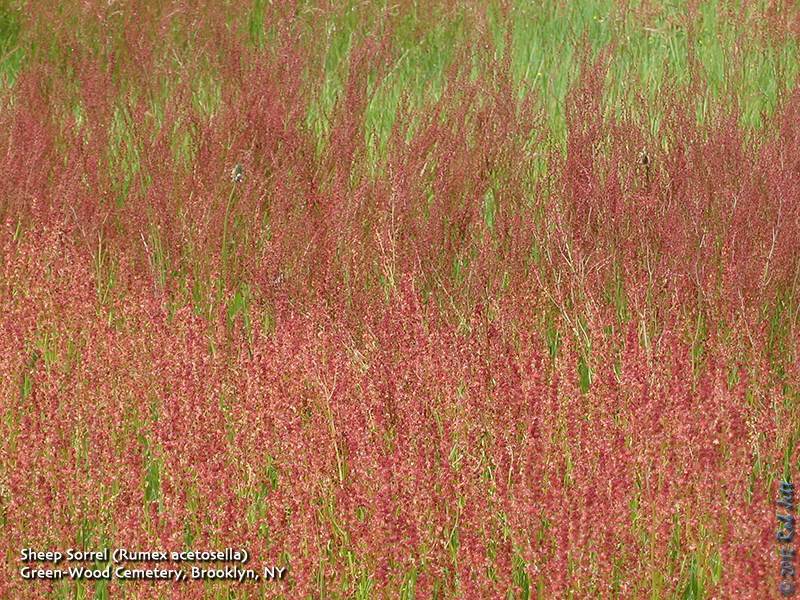 Some of these warbler-like birds will stay and nest around NYC, usually near water. We spent a few minutes watching a Great Egret hunting for fish at the edge of the Crescent Water before picking up our pace and heading towards Big Mama and Junior's new nest. We heard, then saw a pair of Eastern Towhees on the hillside above the Catacombs. Above them a Blue-headed Vireo sang his lazy song from a Sweetgum tree. Several yards from the Catacombs I heard the "zoo-zee, zoo-zoo-zee" song of a Black-throated Green Warbler and persuaded the group that it would be worth the steep walk up Ocean Hill to find the source of the song. It took a minute or two, but we spotted this brilliant yellow-faced bird with the black bid foraging low in a tree adjacent to Stephen Whitney's chapel. Everyone got great views of this very cooperative songbird. I think that there are more mockingbirds in Green-Wood Cemetery per acre than any other city park. Throughout our walk I was constantly reminded of this as I "translated" the mimicked songs of these birds every few minutes. Occasionally one would fool me by performing a near perfect imitation of a Spring migrant, but an extended listen would erase any doubts as they sang their way through a mashup of various species. I guess they do so well in Green-Wood Cemetery because the neighbors here rarely complain. Who knew that a Praying Mantis could be so cute? This individual found hatching at Floyd Bennett Field is literally seconds old. 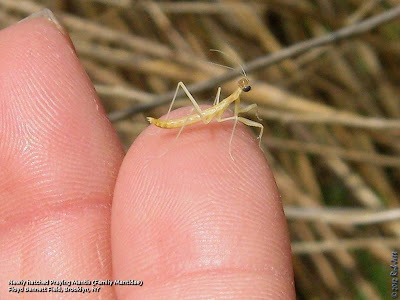 I am not 100% certain of the identity of this tiny insect and, according to the website Herper.com, there are 21 species of mantids found in North America. Unfortunately, most are introduced from around the globe with the Chinese mantis (Tenodera sinensis) and European mantis (Mantis religiosa) being the most common here in NYC. Longtime birder and experienced trip leader Starr Saphir has a new website. I've known Starr since I began birding over twenty years ago (she has been birding for over 60 years!) and she leads regular trips in Central Park. If you can't attend her trips you can enjoy them vicariously through her reports page here. This is a guest post from Richard Louv, author of The Nature Principle: Reconnecting to Life in a Virtual World and Last Child in the Woods: Saving Our Children from Nature-Deficit Disorder. A recent study found that preschool children aren't getting enough time outdoors. Almost 50 percent of 3-to 5-year-olds studied weren't taken outside everyday. There are many factors that contribute to these sad findings, but parents and educators can, and should, find ways to incorporate play time in a child's life. Below are five simple steps to help connect your family to nature and community. 1. Just do it – and think simple. If we want our children or grandchildren to experience nature, we’ll need to be more proactive than parents of past generations. For small children (or older ones, too), start in the back yard. Encourage them to build forts, dig a hole, or plant a garden. A small pickup load of dirt costs the same as a video game, and provides more hours of creative, self-directed play. Some of the best toys are the simplest and least expensive. Did you know that the cardboard box and the stick have been inducted into the National Toy Hall of Fame? 2. Be a hummingbird parent (not a helicopter parent). To reduce parental fear, Michele Whitaker, a guest blogger for The Grass Stain Guru, suggests that we become hummingbird parents: encouraging young children to play outside, but watch from a distance. “I tend to stay physically distant to let them explore and problem solve, but zoom in at moments when safety is an issue (which isn’t very often),” She writes. Notice that she isn’t hovering over her kids with nature flash cards. She stands back and makes space for independent nature play. 3. Create or join a family nature club. Nature clubs for families are beginning to catch on across the country; some have membership lists of over 400 families. The idea is that multiple families meet to go for a hike, garden together, or even do stream reclamation. We hear from family nature club leaders that when families get together, the kids tend to play more creatively — with other kids or independently — than during single-family outings. C&NN’s Nature Clubs for Families offers a free downloadable guide on how to start your own. 4. Help create a Homegrown National Park. Doug Tallamy, a professor at the University of Delaware, encourages children and adults to replant their yards with native species to create a vast network of wildlife corridors — ones that help make our cities into biodiversity engines, improving human health and well-being, and bring back butterfly and bird migration routes. 5. Submit your ideas to the CLIF Kid Backyard Game of the Year. You can find nature nearby, right in your backyard. The folks at CLIF Kid, maker of organic snacks for kids, have come up with a great way for parents to reconnect their kids with outdoor play and their own imaginations. Now in its second year, the CLIF Kid Backyard Game of the Year contest asks kids ages 6 – 12 to submit their ideas for their very own backyard game. The rules are easy: Invent a game for two or more kids to play using basic items that can be found around the house or in nature. Six finalists will win educational scholarships, bikes and helmets and a trip to San Francisco for the Backyard Game Playoffs in July. The grand prize winner will be awarded a $10,000 scholarship. Submissions can be made online. "Sit" lasts to 9:30-10 am based on bird numbers; or meet earlier 6:15 am at the Vanderbilt Street and Prospect Park Southwest Ave park entrance. No registration. Meet at Main Gate (25th and Fifth Ave., Brooklyn) at 8 a.m. Public transportation. Hike around refuge trails to look for migrating warblers, orioles tanagers and many other species. Call (718) 318-9344; e-mail: donriepe [AT] gmail.com. 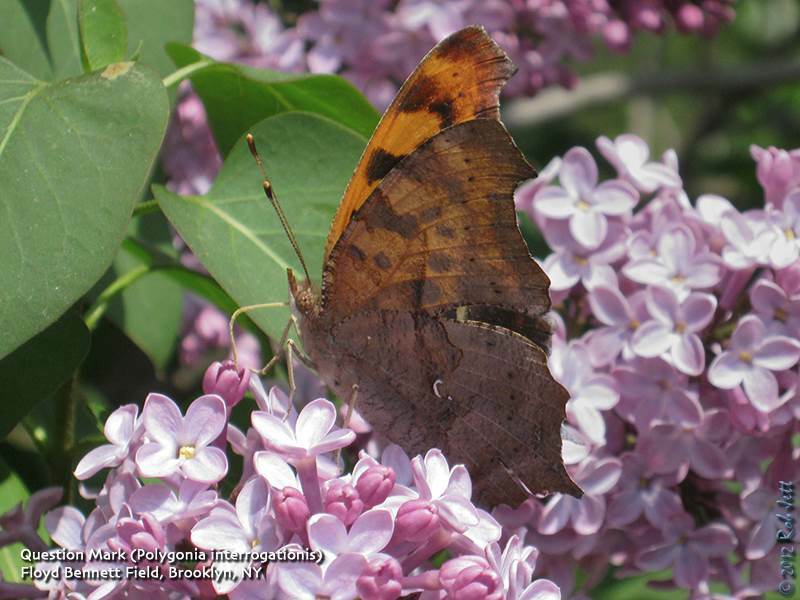 Join Mickey Maxwell Cohen, American Littoral Society naturalist, on a three-mile trek around the wild western tip of the Rockaway Peninsula. Participants will carpool to the site. Sunday, April 29, 2012, noon to 3 p.m.
Join Hillel on a level, easy walk of the Blue Trail through High Rock Park to the Overlook and back. Meet at the High Rock Park parking lot at the top of Nevada Avenue. We go in all weather. Bring snacks and beverage and wear comfortable shoes and clothes. Call (718) 477-0545 for more information. Areas of the western US lacking precipitation should experience widespread light to moderate migration early in the forecast period, but an increasing threat of precipitation later in the week may shut down movements in many places. The Great Plains begin the period with largely unfavorable conditions for bird movement, but by midweek southerly flow returns and widespread moderate movements should occur. A frontal passage will make for poor conditions across the Upper Midwest, but favorable conditions for moderate movements in the Northeast to begin the period. Better conditions for more widespread moderate movements should develop around midweek. The Gulf Coast and Southeast begin the period with the passage of a front that could spawn some coastal fallouts in the western Gulf region; but this front will shut down the trans-Gulf migration system until midweek, when a return to more widespread moderate movements begins. The western U.S. should see a good movement of Black-throated Gray Warblers this week. Expect arrivals across the breeding range from Colorado to Washington, Oregon and into British Columbia. 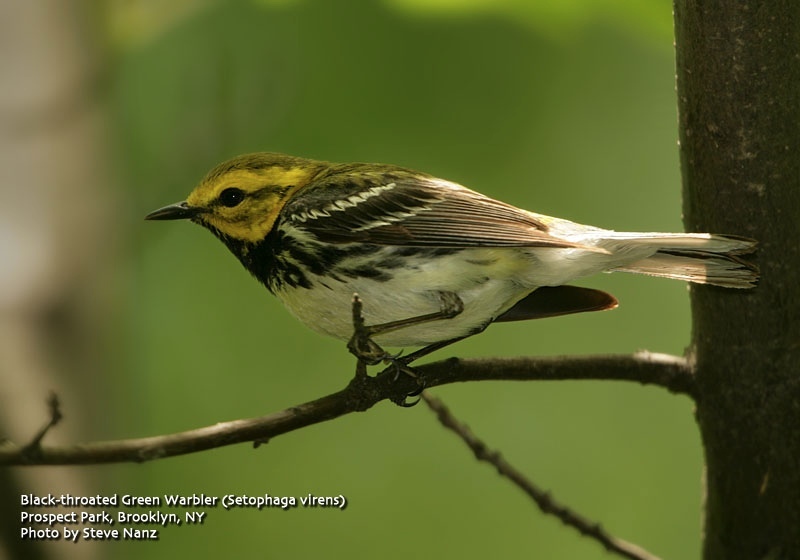 Migrants are likely to be found with flocks of Yellow-rumped Warblers, kinglets and other landbirds. Late April and the first couple days of May are also excellent times to watch for this species in the Great Lakes region, where very rare. There are several records that stretch from New York to Ohio and Wisconsin for this time period. There is even a record from St. Catherine's Island, Georgia. Take a look at the April and May map here and zoom into your region of interest. Greetings. 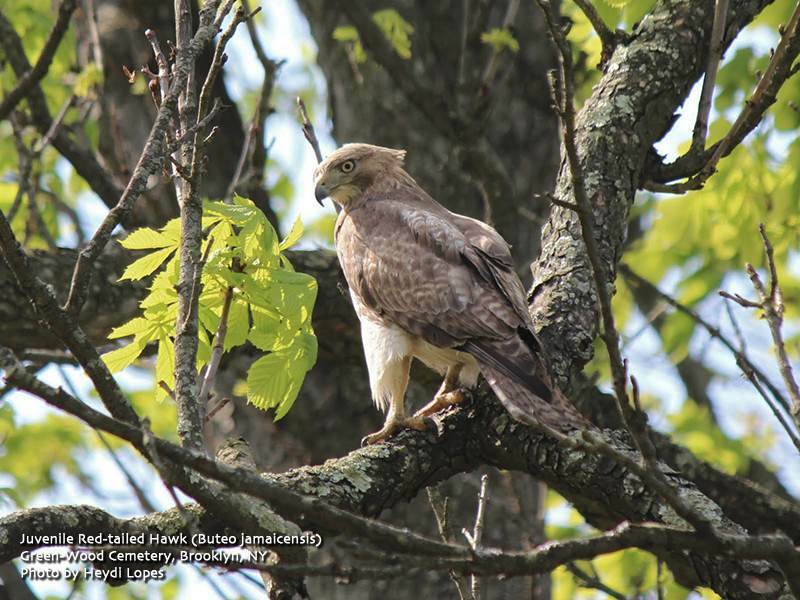 This is the New York Rare Bird Alert for Friday, April 20th at 7:00pm. The highlights of today's tape are SWALLOW-TAILED KITE, YELLOW-THROATED WARBLER, ORANGE-CROWNED WARBLER, RED-HEADED WOODPECKER, and other spring migrants. As spring migration progresses, seemingly more accelerated than normal, two negative aspects are shaping up to impact birding during the peak period: the early leafing out of trees, and the lack of water. The latter may be alleviated somewhat this weekend with heavy rain forecast, but for now the waterhole at Forest Park, for instance, is completely dry. Certainly the week's most interesting report involved a SWALLOW-TAILED KITE spotted from Lookout Hill in Prospect Park on Thursday, this following one that had moved north over Sandy Hook on Tuesday. Also interesting has been a larger than normal influx of YELLOW-THROATED WARBLERS. Over last weekend on Saturday, at least four were reported. Three in Manhattan involved one in Central Park's Ramble also noted Sunday, one in Riverside Park on Saturday only, and one Saturday in Inwood Hill Park, while Prospect Park in Brooklyn added another Saturday on Lookout Hill. On Monday another YELLOW-THROATED WARBLER was found in Alley Pond Park in Queens, the season's second there, and this was followed by a YELLOW-THROATED next to the Coast Guard Station at Jones Beach West End in Nassau County on Wednesday, this same day finding a HOODED WARBLER in the West End median. A few more reports than normal of ORANGE-CROWNED WARBLER have also occurred lately, with two in the north end of Central Park and two in Prospect Park Thursday. Two HOODED WARBLERS were in Central Park today, and WORM-EATING WARBLER has been seen in both Central and Prospect Parks. Otherwise there has been a relatively widespread influx of expected earlier migrants throughout much of the region. Warblers noted recently have included NASHVILLE WARBLER, NORTHERN PARULA, BLACK-THROATED GREEN WARBLER, PRAIRIE WARBLER, YELLOW WARBLER, BLACK-AND-WHITE WARBLER, NORTHERN WATERTHRUSH, OVENBIRD, and COMMON YELLOWTHROAT; these in addition to the already present PINE WARBLER, PALM WARBLER, YELLOW-RUMPED WARBLER and LOUISIANA WATERTHRUSH. Some WHITE-EYED VIREOS and WARBLING VIREOS have joined the widespread BLUE-HEADED VIREOS, while arriving sparrows include some CHIPPING SPARROWS, SAVANNAH SPARROWS, and SWAMP SPARROWS. A WHITE-CROWNED SPARROW was singing at Riverside Park last Sunday. EASTERN KINGBIRD and WOOD THRUSH have also been reported. HOUSE WRENS have become quickly common, and a few RUSTY BLACKBIRDS continue in the area. The breeding plumaged RED-NECKED GREBE was still on the lake by the golf course at Van Cortlandt Park in the Bronx Monday, and an EASTERN MEADOWLARK was unusual there last Saturday. Unexpected in Central Park were an AMERICAN BITTERN in the North Woods on Tuesday and a GREAT HORNED OWL in the Ramble on Thursday. Arriving shorebirds have featured SOLITARY SANDPIPER and SPOTTED SANDPIPER and a WILSON'S SNIPE in Central Park, one or two scattered UPLAND SANDPIPERS, and some WILLETS along the coast, where a small number of GREEN HERONS have also been noted. YELLOW-BILLED CUCKOO was first spotted in Central Park last Monday, and a few CHIMNEY SWIFTS are beginning to drift through. Various herons, including TRICOLORED HERON, LITTLE BLUE HERON, and YELLOW-CROWNED NIGHT-HERON are at appropriate coastal sites. Some BROAD-WINGED HAWKS have been passing through inland, and a few WHIP-POOR-WILLS are already on territory to our north. Over last weekend more birds began moving through the area and we had a big jump in the total number of species seen. Sunday's forecast looked promising as winds shifted to the south overnight. 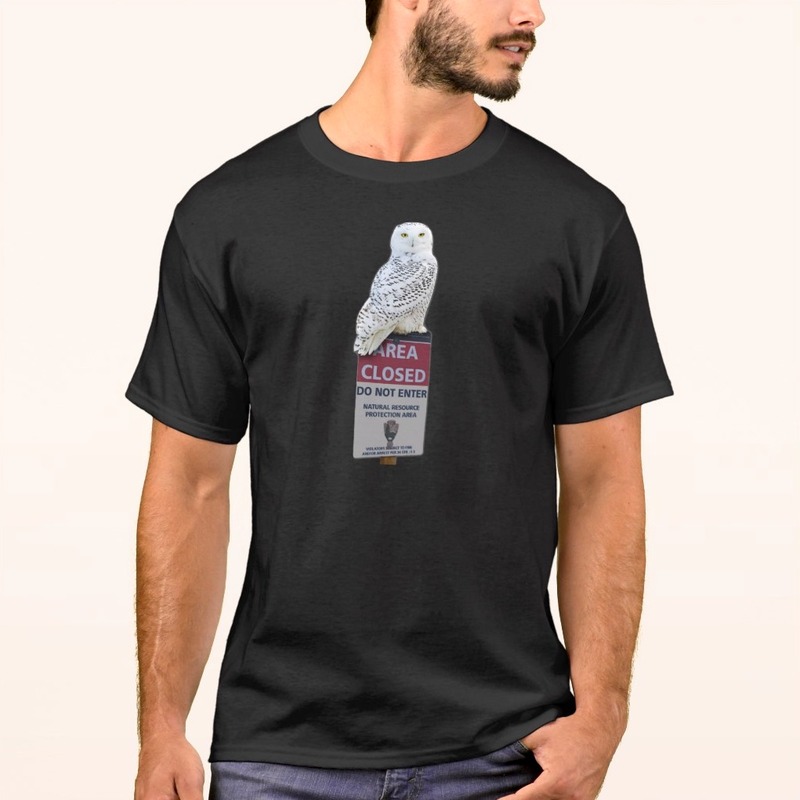 Birders from around the area crossed their fingers for a big weekend fallout. Heydi and I had made up our minds that we had to find a Yellow-throated Warbler. Queens had located one of these southern overshoots in Alley Pond Park and, according to our records, there had to be one somewhere in Brooklyn, so why not Prospect Park. As usual at this time of year we began our day at dawn at the north end of Prospect Park and worked our way south. There were plenty of Ruby-crowned Kinglets, Yellow-rumped Warbler and Hermit Thrushes early on, but nothing unusual. 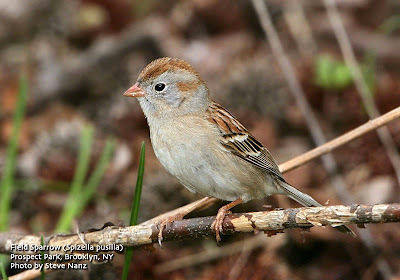 In the Vale of Cashmere I heard the simple, bouncing ping pong ball trill of a Field Sparrow - my first of the year. As we made our way onto Nelly's Lawn I spotted a large, low flying waterfowl. It had an all white body, dark head, matching orange feet, legs and bill ... clearly a Common Merganser, which is rare for Prospect Park. We assumed by its direction that it was headed towards Prospect Lake, where we'd catch up with it later. It wasn't and we didn't. The first couple of hours of the day were fairly productive with the greatest diversity of birds that we'd seen in the park so far this year. As we approached the top of Lookout Hill we spotted a nice mixed flock of songbirds near the stairway that ascends the hill from the Maryland Monument. A Blue-headed Vireo sang his lazy "where are you, here I am" melody while a tiny gnatcatcher whispered his barely audible insect lisps. There were also Pine, Palm and Yellow-rumped Warblers within the flock. At one point I heard a familiar song that I couldn't place. 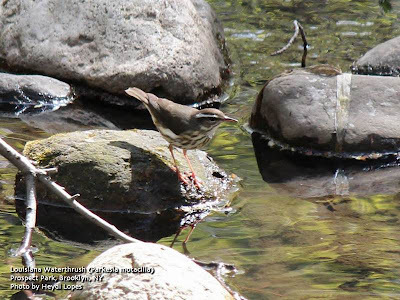 It reminded me of the long slurs of a Louisiana Waterthrush song, but not exactly and its source was up in a tree, not where one would find a waterthrush. After a moment of searching Heydi and I shouted in unison, "Yellow-throated Warbler!" As she struggled for her camera, I fumbled for my phone. I wanted to get the word out quickly about this rare southern visitor. Unfortunately, the bird stayed only briefly and took off with most of the songbird flock. Later in the morning we spotted a Louisiana Waterthrush and Rusty Blackbird, both predictably foraging along the edge of the water in the park's "Ravine". A walk through a very crowded Brooklyn Botanic Garden (it was free Saturday) didn't turn up anything unusual, although the blooms were gorgeous. By mid-afternoon on Saturday the winds had shifted to the south. 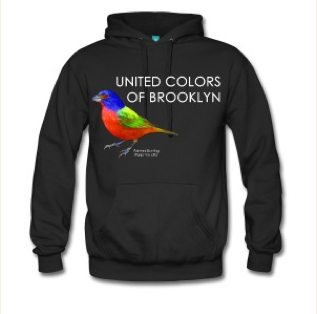 Like most NYC birders we were psyched that Sunday would be an even birdier day. That bit of optimism was short lived as the first hour of light on Sunday revealed much fewer birds. My guess is that many of the birds that had been present continued north Saturday evening. Migrants that had been south of the "Big Apple" either didn't travel very far or took the express and passed us over completely. Sunday wasn't a complete bust, however, as we did have a couple of interesting experiences. The first occurred while we were still in Prospect Park. We had gone back up to Lookout Hill hoping that, somehow, the Yellow-throated Warbler had returned to the exact spot from the prior morning. It hadn't. On our way down the south side of the hill we ran into Rob and his wife, Tracy. As we were chatting Tracy pointed out a White-breasted Nuthatch in the tree above us. We all looked up and noticed that there were actually two on a large, horizontal branch. The female nuthatch was perched on the branch and rapidly fluttering her wings. The male was dancing in circles around her with his tail cocked in almost a vertical position. Their dance continued for about a minute when it suddenly ended with the male mounting the female. Who knew that these common birds performed such a lovely courtship dance? 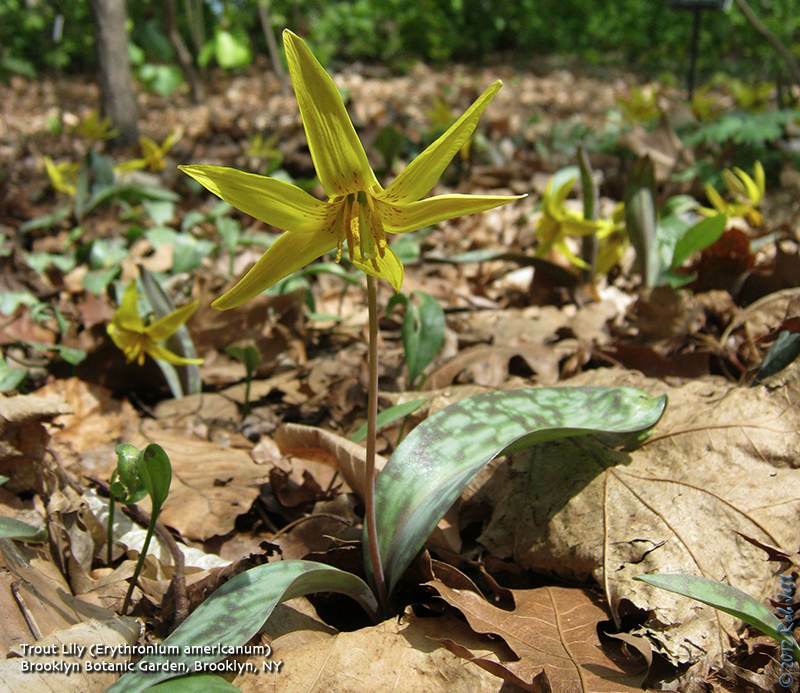 Named for the leaf's similarity in color and pattern to certain trout species, the Trout Lily is currently blooming around our city parks. 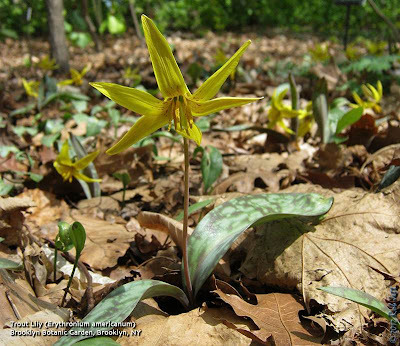 You'll have to know where to look, however, as they aren't as obvious as tulips and daffodils. 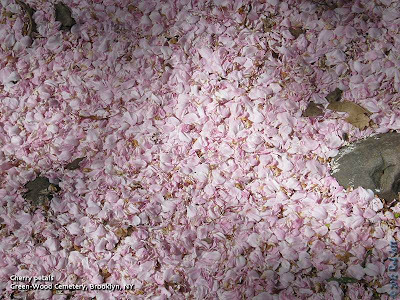 Found in moist woodlands with rich soil, they can been seen during their brief bloom in the native floral section of the Brooklyn Botanic Garden, as well as, a little known piece of forest in Prospect Park near the carousel. Tomorrow morning's Prospect Park tour is cancelled. I hate to do this two weeks in a row, but I have a scheduling conflict. This morning's Green-Wood Cemetery trip was really nice with a few highlights. There's a species list below. 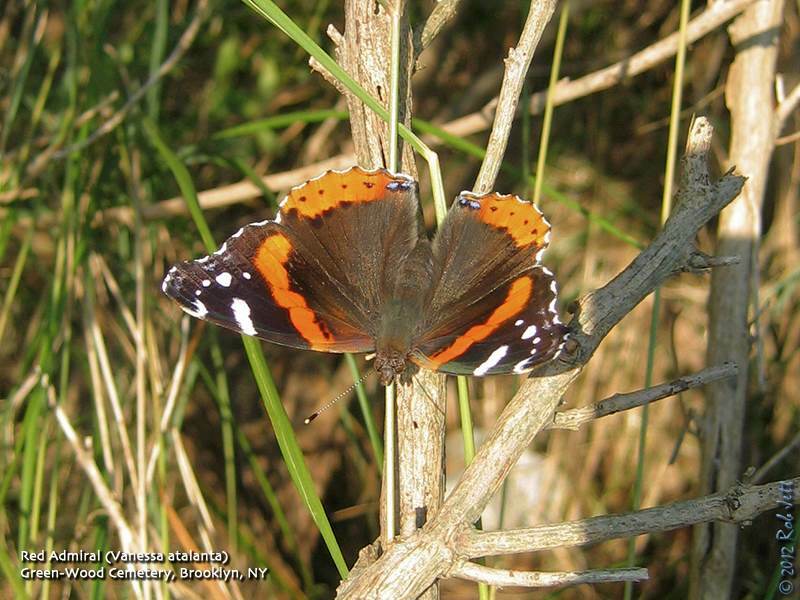 Two interesting observations were the season's first House Wrens and the emergence of many Red Admiral butterflies. I'll post the past weekend's summary and some photos tomorrow evening. An article just published on the BBC website describes how scientists can now more accurately count the number of Emperor Penguins in the Antarctic. The good news is that there are nearly twice as many as previously thought. Nearly twice as many emperor penguins inhabit Antarctica as was thought. Climate modelling has suggested their numbers could fall in the decades ahead if warming around Antarctica erodes the sea ice on which the animals nest and launch their forays for seafood. "If we want to understand whether emperor penguins are endangered by climate change, we have to know first how many birds there are currently and have a methodology to monitor them year on year," said Peter Fretwell from the British Antarctic Survey (BAS). "This study gives us that baseline population, which is quite surprising because it's twice as many as we thought, but it also gives us the ability to follow their progress to see if that population is changing over time," he told BBC News. Their survey identified 44 key penguin colonies on the White Continent, including seven that had not previously been recognised. Although finding a great splurge of penguin poo on the ice is a fairly straightforward - if laborious - process, counting individual birds in a group huddle is not, even in the highest resolution satellite pictures. This means the team therefore had to calibrate their analysis of the colonies by using ground counts and aerial photography at some select sites. Fretwell and colleagues totted 595,000 penguins, which is almost double the previous estimates of 270,000-350,000 emperors. The count is thought to be the first comprehensive census of a species taken from space. Co-author Michelle LaRue from the University of Minnesota said the monitoring method provided "an enormous step forward in Antarctic ecology". "We can conduct research safely and efficiently with little environmental impact," she explained. "The implications for this study are far-reaching. We now have a cost-effective way to apply our methods to other poorly understood species in the Antarctic." Nonetheless, computer modelling suggests a warming of the climate around Antarctica could result in the loss of more northern ice floes later this century. And given that the krill (tiny crustaceans) that penguins feed on are also dependent on the ice for their own existence (they feed on algae on the ice) - some colonies affected by eroded floes could face a double-whammy of high fledgling mortality and restricted food resources. But this can all now be tested by the methodology outlined in the PLoS paper. "The emperor penguin has evolved into a very narrow ecological niche; it's an animal that breeds in the coldest environment in the world," explained Peter Fretwell. "It currently has an advantage in that environment because there are no predators and no competition for its food. "If Antarctica warms so that predators and competitors can move in, then their ecological niche no longer exists; and that spells bad news for the emperor penguin."